Salesforce admins are the people who bring innovation to life. Fighting inefficiency, spreading innovation, and championing productivity wherever they can, Salesforce Admins are the humble heroes who connect their companies to their customers in entirely new ways. Learn how to deliver innovation and data-driven business decisions at your company with Salesforce. Join Parker Harris, co-founder, Shawna Wolverton, VP Product, and Sarah Franklin, Head of Admin Marketing in a celebration of our Salesforce admins. In 2016 we were presenters at Dreamforce, Salesforce.com's annual tech conference which had over 130,000 registered attendees. 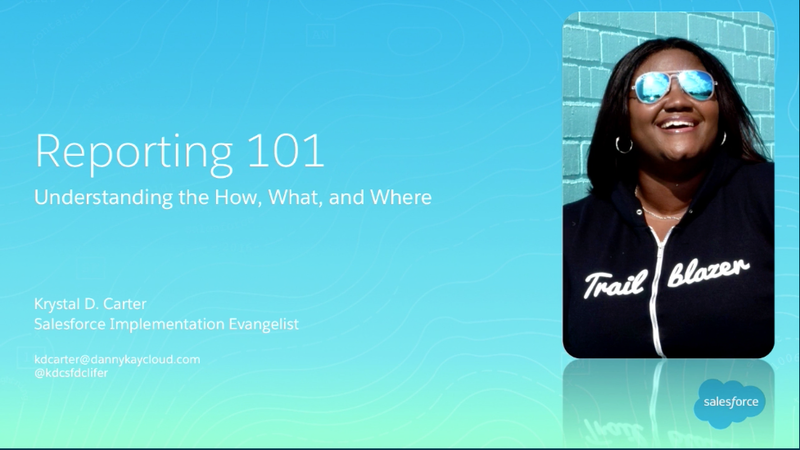 Krystal, having an unnatural obsession with reports and dashboards, shared with Salesforce Admins tips for asking the right questions in order to create the best reports.